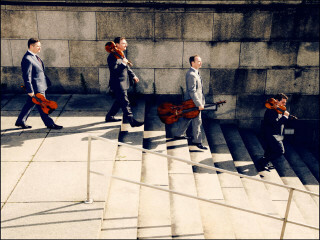 One of the world’s most popular string quartets, renowned for their expert playing and stunning treatment of the classical repertoire, a Jerusalem Quartet concert is always a crowd-pleaser. These exceptional musicians bring to the Chamber Music Houston stage an evening of stunning compositions, including Beethoven’s compact, energetic “Serioso” quartet. When Janáček composed Quartet No. 1, inspired by Tolstoy’s novella The Kreutzer Sonata, he wrote that he imagined a poor woman, weary and worn as the author described, and set out to write a piece that would resonate with conflict, passion and pathos.